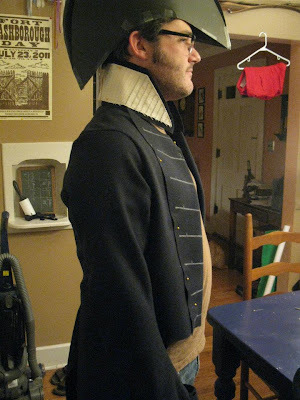 It is not quite complete, but I can tell you that my reproduction of a Royal Navy Surgeon's Coat has been the result of many hours of research and hard work. And not just work on MY part, but on the part of many people. Let's talk about where it came from. In the National Maritme Museum (NMM), there is an extant example of a Royal Navy Surgeon's coat from 1807 that belonged to a surgeon by the name of Joshua Horwood. They have almost every piece of his uniform... coat, waistcoat, breeches and hat. So I decided early on that I wanted to try to emulate Horwood's uniform as best I could so as to more accurately portray a surgeon from the period. 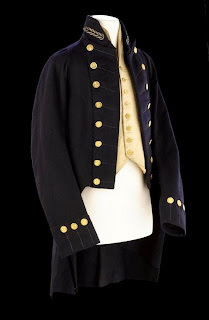 "I can tell you that the regulations issued in 1805 state that ‘Surgeons of Hospitals to wear two embroidered Button-holes on the Collar; Surgeons of Ships, one.’ The regulations for this period are not always clear as the admiralty would also have produced a regulation pattern of clothing, called a sealed pattern, for tailors to copy. Further, our particular surgeon, Joshua Horwood, appears to have settled for an extremely cheap coat – the tailoring and materials are not very nice at all. 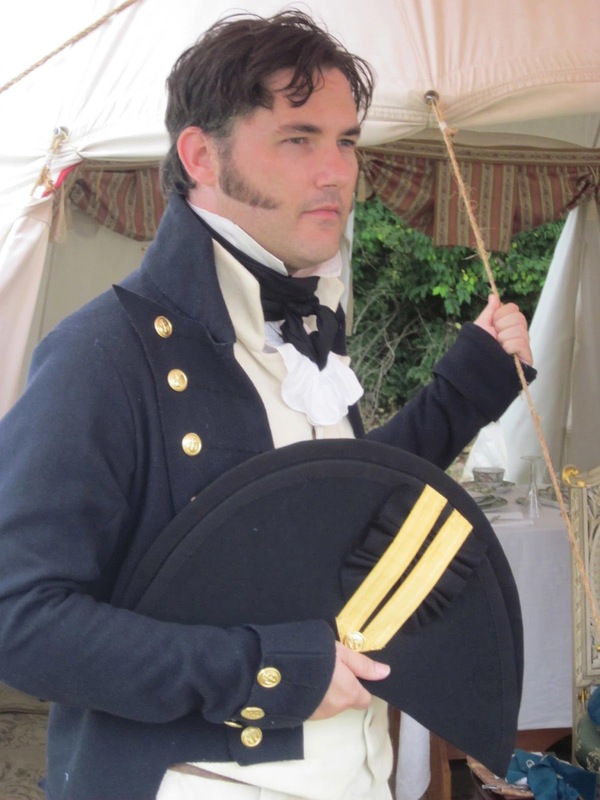 Since the officer had to provide the uniform at his own expense, it would appear that Horwood did not really want to pay for high end tailoring." 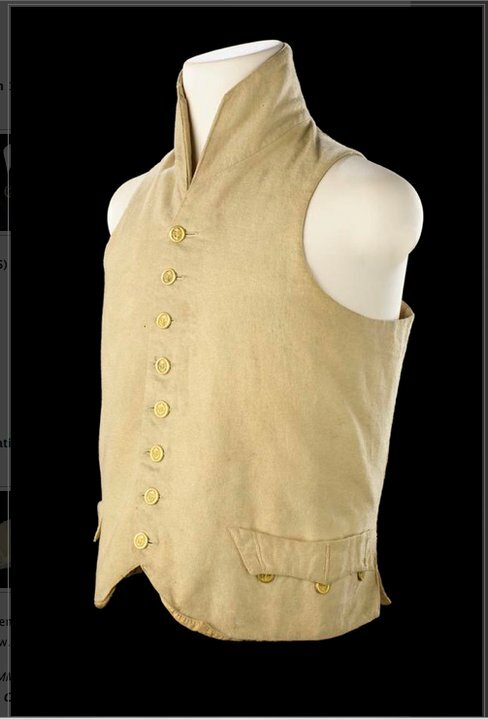 For the sake of my own comfort, it was decided that the small clothes (waistcoat & breeches) would be constructed from russian drill instead of wool. Wool is great at sea and in cooler climates, but not in the American South in the heat of the summer, which is when I attend the bulk of my events. Maggie (my seamstress/fiance) modified a Kannick's Korner waistcoat pattern to more closely resemble the Horwood waistcoat with its tabs at the bottom, and I hand drew a little pattern piece to emulate the faux pocket flaps. 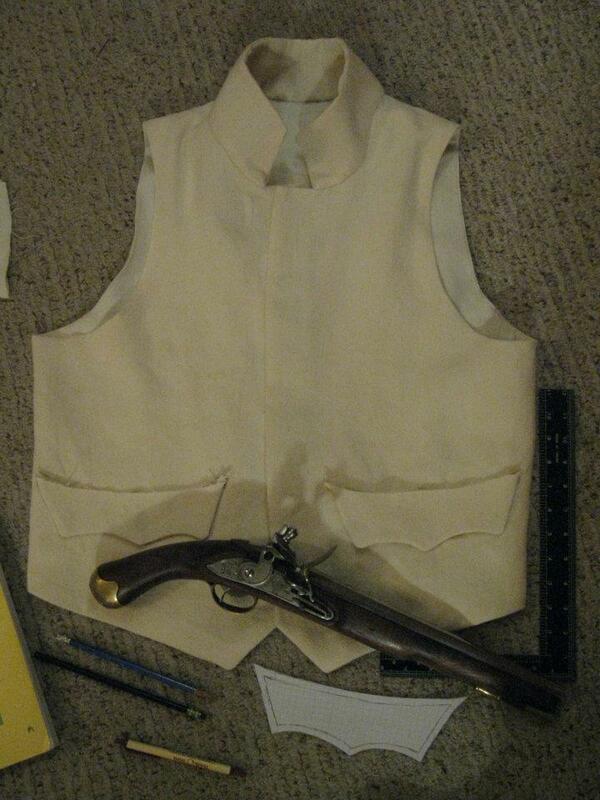 The repro coat in production. 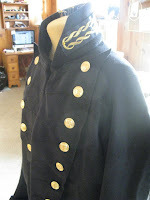 The coat is another modified version of a Kannick's Korner pattern. We altered it so that the flaps in the front were one continuous piece instead of being separate bits that were attached. 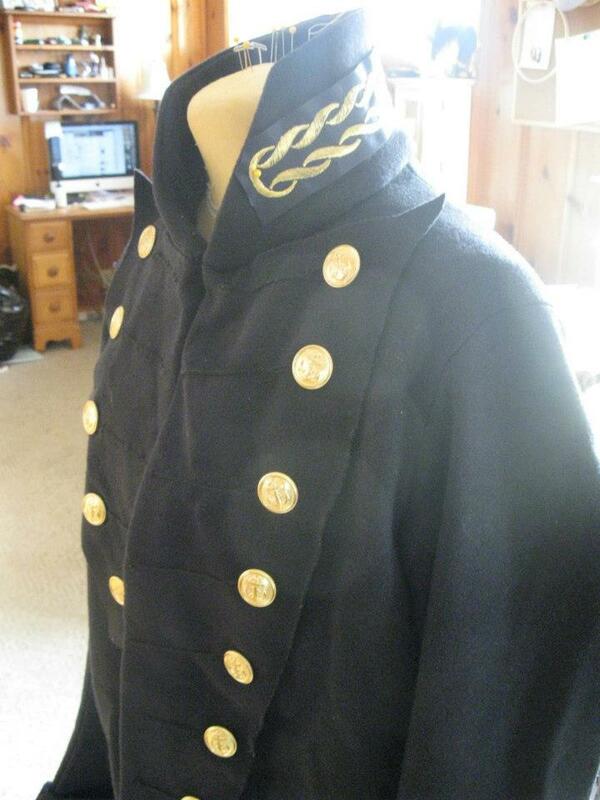 The wool is a tropical weight navy that is used in the creation of cold weather uniform coats for the NYPD. I cannot speak too highly of the quality of this wool, it's really spectacular. Big thanks to Maggie Waterman... you made me CLOTHES! She is very talented and stuck with the project, even when it frustrated her half to death. Wanna see how talented she is? Of course you DO! Also, special thanks to Michael Ramsey who helped along the way and would give Maggie several much-needed pep talks when she'd get discouraged. 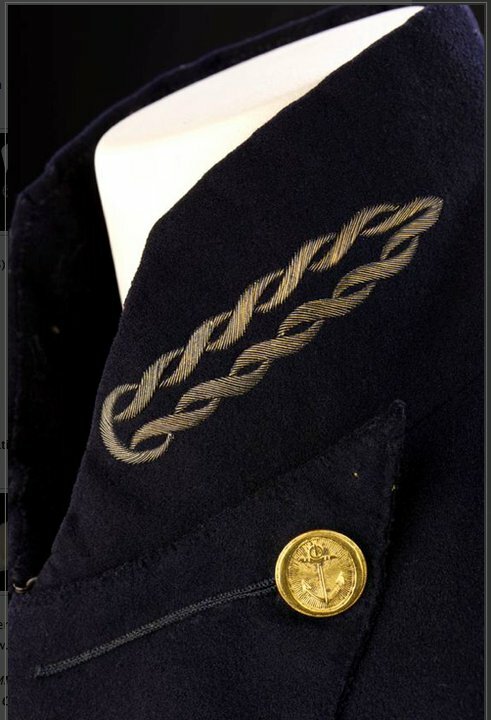 I have had a great deal of difficulty in discovering whether the 'single embroidered button hole' design on the coat collar was stitched in silver or gold thread. Close examination of the image from the NMM's collection would seem to indicate that it is either faded gold or tarnished silver. After a great deal of consulting with friends and folks who are 'in the know' about such things, the final word (in MY mind anyway) came from my email from Amy Miller of the NMM. "...I can tell you that after looking at the embroidery under magnification, it is gold (in this case a very cheap alloy, hence the tarnish)." The 'test braid' pinned to my coat. I am certain that in my quest to discover the proper color of thread, I aggravated my friends to death. Special thanks to Patrick Schifferdecker, Tom Tumbusch, Michael Ramsey and others for their input and for putting up with me. My initial attempts at hand embroidering the collar braid looked like amateur hour at the quilting bee, it was pretty foul. After some hunting around, I found a woman in my neighborhood who could do the work, and at a price that won't break the bank. The surgeon's hat was a different proposition. The photo from the NMM website is small and dark, making details difficult to discern. 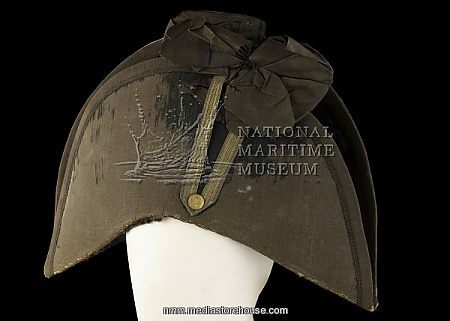 But comparing the photo to some of the drawings of hats and uniforms from the period made it possible to come up with something that resembles a proper surgeon's chapeau. After having a look at a reproduction chapeau bras that belonged to Mr. Mike McCarty and an original hat that was part of my local museum's War of 1812 exhibit, I got my nerve up to create a series of mock-ups that would eventually lead to the construction of a finished product. 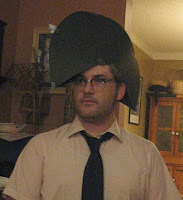 The Mark I "Chafaux Bras" as I nick-named it, was a simple hat made from two sheets of black poster board from my local drug store's school supply aisle and some clear tape like you use to wrap Christmas presents with. The Mark I was an attempt for me to get my head around the engineering involved in the hat and making it fit and fold shut when you tuck it under your arm. The Mark II "Chafaux" was a slightly more complicated production. Slightly more rigid cardboard underneath some cheap black fabric. The Mark II hat made me more confident in some of the steps we would have to go through in order to make the finished product happen... like glue and trim. 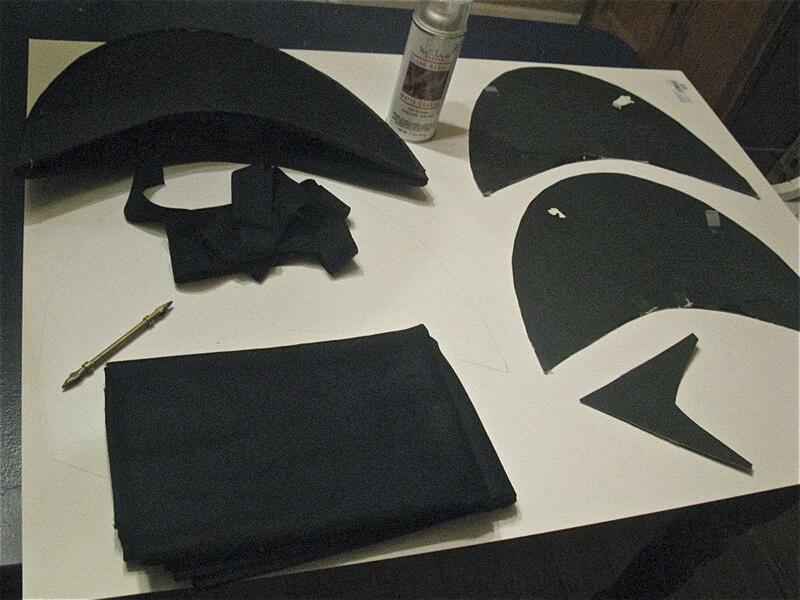 A moment of silence for the Mark I which bravely sacrificed itself for the pattern pieces of the finished hat. The Mark II is visible at the upper left. Thanks to Mr. McCarty for allowing me to examine the construction of his chapeau, and for making me feel like it was not the impossible task that I had originally thought it might be. 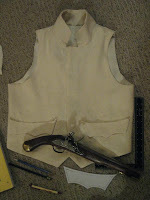 I've tried to leave out all the tedious bits like cutting out the small clothes from the Russian Drill around the weird bleachy spots, the never ending quest for proper buttons that don't cost a fortune, finally finding said buttons and having too manually adjust the shanks to all face the same direction, etc. Thanks to everyone who helped design, construct, glue, stitch, research or encouraged me over the course of the project. You guys are awesome and have helped make something really special for me, and I won't forget that. No collar embroidery, but otherwise finished. From the Fair at New Boston. "...this uniform is an extremely rare survival and is, to my knowledge, the only extant example." 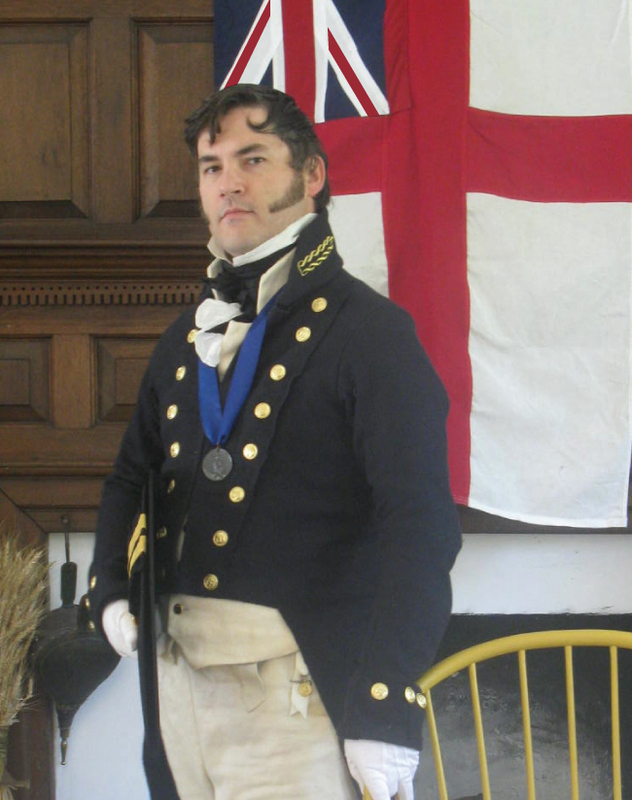 The finished uniform with collar braid. Gorgeous! So awesome you have someone who has the skills and patience to create such a wonderful piece of art! You look amazing in it.